Fyodor Vasiliev Aleksandrovich (10  February 1850, Gatchina — September 24 [October 6] 1873, Yalta) — Russian landscape painter. Based on the data of the first biographers of Vasilyev, it is considered (although documents about the place and date of birth of F. A. Vasilyev were not found) that he was born on February 10 (22), 1850 in Gatchina (now the Leningrad Region) in a small postal official from Petersburg. At the age of twelve, he was served in the main post office, where he received 3 rubles of salary per month. From early childhood, showed the ability and interest in drawing. He quit the service and went to study at the Drawing School of the Society for the Encouragement of Arts in St. Petersburg (1865−1868), at which time he combined classes at school in the evenings with the work of the restorer from the Academy of Arts P. K. Sokolov. By the end of his studies, Vasiliev entered the environment of famous artists, especially became close with Kramskoy and Shishkin. 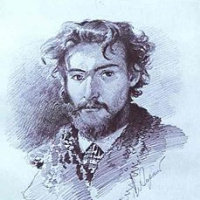 An important event in this period for the young artist was his trip to the island of Valaam, where, together with I. I. Shishkin, he worked for more than five months: from June to late autumn 1867. 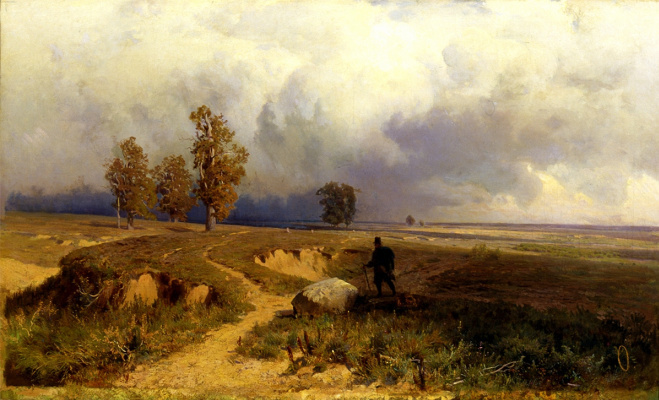 In 1869, Vasilyev went to the Tambov province, to the estate of Count P. S. Stroganov, the village of Znamenskoye (in summer), and to Ukraine, also to the estate of P. S. Stroganov, to the village of Hoten (autumn). These trips have played a favorable role in the development of the artist’s original talent. In 1870, Vasilyev, together with artists I. Repin and E. Makarov, embarked on a trip along the Volga. They sailed along the great river from Tver to Saratov, and arranged a creative apartment in the vicinity of Stavropol Samara, opposite Zhiguli . A lot of impressions and many drawings from this Volga summer served as the basis for a number of paintings, the most significant of which are "View of the Volga. Barques and Volga Lagoons. Upon returning from a trip, Vasiliev creates the "Thaw". The picture immediately became an event of Russian artistic life. Her author’s repetition, in warmer colors than the first version, was shown at the 1872 World’s Fair in London. While working on the painting "The Thaw", in the winter of 1870, Vasiliev had a bad cold, he was diagnosed with tuberculosis. 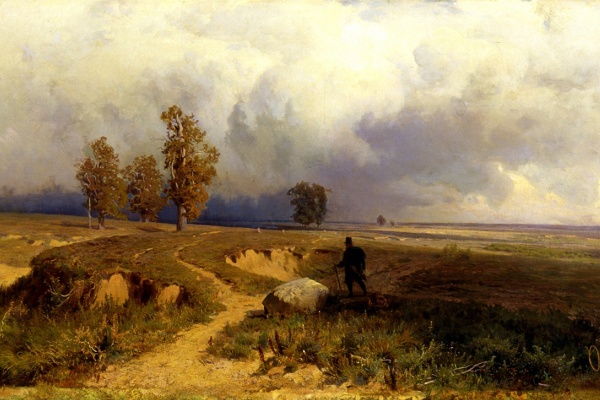 At the suggestion of Count P. S. Stroganov, the artist spent the summer of 1871 on his estates in Kharkiv and Voronezh provinces, but he never recovered. The Society for the Encouragement of the Arts gave him the means to travel to the Crimea (even before he left, Vasilyev was enrolled as an independent student of the Academy of Arts and received the title of a first-degree artist with the condition to pass the exam from the scientific course). In Crimea, Vasiliev spent the last two years of his life. During this period he creates many drawings (pencil, watercolor, sepia) and paintings. The central work on the Crimean nature is the big picture "In the Crimean Mountains" (1873, Tretyakov Gallery). In the Crimea, Vasilyev also wrote significant pictures on the nature of the north: "Morning", "Abandoned Mill", "Swamp in the forest. Autumn "(1873)," Wet Meadow "(1872, Tretyakov Gallery). Honorary free member of the Academy of Arts (since 1873) . The artist worked a lot and hard, sometimes at the expense of treatment. This did not contribute to recovery and led to a tragic end. F.A. Vasilyev died on September 24 (October 6), 1873 in Yalta. The grave is located in the same place, at Polikurovsky cemetery.